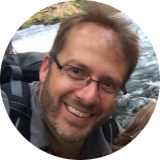 California State Parks – Tour Guide Mark – Let's Go Exploring! 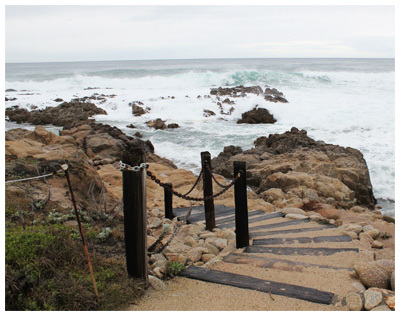 Point Lobos State Natural Reserve is a diamond of natural beauty along California’s central coast. This beautiful place offers a treasure of colors, dramatic landscapes, green forests, rugged coves, weathered trees, and grey fog to brilliant sunlight. It can be easy to see birds of prey overhead, flittering butterflies, quiet deer grazing, or the heads of sea lions and harbor seals popping up from the surf. 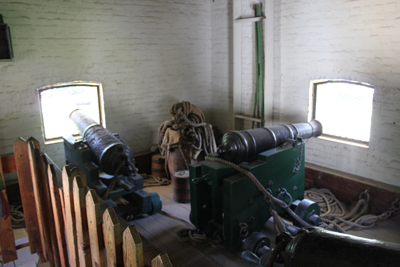 The air is clean here and provides the visitor with a measure of restoration. This wonderful place does have a strict limit on the number of visitors at any one time, limiting visitors to 450 people, so not to cause unacceptable damage to this great setting. The summertime can be very busy here and in the neighboring town of Carmel, sometimes causing traffic to become bottlenecked on the Coast Highway 1. Plan to arrive early for the best opportunities to see animals and avoid any late afternoon crowds. If you can visit in the wintertime or spring when rains have restored the landscape. The images in this short video were taken on the Winter Solstice when just a handful of visitors were on the trails and the low-angled light from the sun offered the grandest views and colors. Along California’s central coast is a wonderful family destination called Natural Bridges State Beach. The park derives its name from naturally formed arches that were carved from the sand and mudstone cliffs. In the early 1900s three arches were visible, but over the years wave action undercut the formations causing two of them to fall. The third, and last remaining arch is visible today (shown). Most people think of summer as being the best time to visit the coast, but November can offer clear skies, warm sunshine, very comfortable temperatures, and beaches generally free of crowds – even on weekends. At noon on this weekend day, only two-dozen people were visiting this 65-acre park. But the park was being visited by hundreds of non-human visitors. In just a quick five-minute walk inland were hundreds of monarch butterflies! 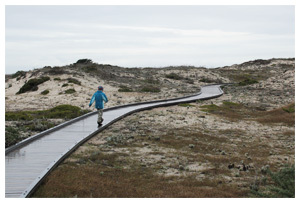 A stroller accessible boardwalk near the visitors center leads to a monarch preserve hidden in a grove of eucalyptus trees. Here monarchs flit overhead and offer great opportunities for humans to see and photograph these beautiful butterflies. In the side photo is a winsome looking monarch that flitted down and landed near the boardwalk. An interpreter at the preserve said that an estimated fifteen hundred monarchs were currently visiting. 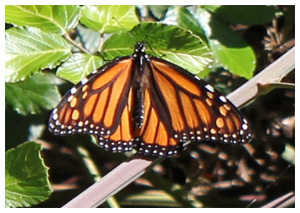 Every autumn, generally mid-October, the monarchs begin arriving at Natural Bridges State Beach. This is just one of several hundred locations along California’s coast where the monarchs stay for the winter. The coast offers them shelter from the cold inland temperatures of winter. Especially fascinating is the monarchs arrive at the coast after traveling hundreds, even thousands of miles. North America is home to two distinct populations of monarchs. The continental divide along the Rocky Mountains provides a natural barrier that the monarchs rarely cross. The monarchs from southeastern Canada and the eastern United States migrate to their wintering home in Mexico while the monarchs in southwestern Canada and the western U.S. migrate to areas along California’s coast. When they arrive they bunch together on branches sometimes forming large clusters. In the spring, as the weather warms, the monarchs begin traveling north looking for milkweed. The milkweed plant is the food source for monarch butterflies. This year at Natural Bridges the monarch population is low compared to previous years when an estimated ten thousand would arrive. When I first saw these monarchs twenty years ago the branches were weighted down by massive clumps of monarchs. Although the number the monarchs are less this year they are still an impressive sight. To learn more about the park visit the Natural Bridges State Beach website. • If a human baby grew as fast and as large as a monarch caterpillar, it would be about the size of a school bus and 2 ½ weeks old! • A monarch tagged in eastern Canada was recovered in central Mexico after traveling a distance of nearly 3,000 miles. • Monarch butterflies have been introduced to every continent in the world except for Antarctica. Only in their native North America do they engage in mass migrations. 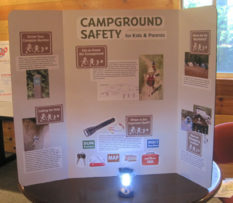 Mark Hougardy, of GlyphGuy LLC, is proud to have supplied California State Park volunteers, Junior Rangers, and enthusiasts with over 10,000 high-quality patches that represent the second largest park system in the United States. This year (2009) is challenging to the existence of many State Parks in California as the state wrestles with a looming budget deficit and possibly closing over 80% of the parks! Maintaining the California State Park brand will be key to keeping the park system in the minds and eyes of visitors and voters. 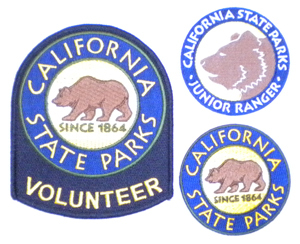 We hope that our patches will continue to represent the image and quality deserving of California State Parks. 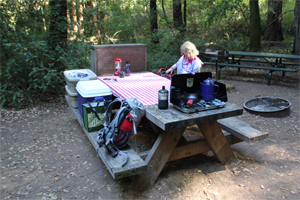 My family recently participated in a multi-family school camping trip to Portola Redwoods State Parks in the heart of the Santa Cruz Mountains of California. 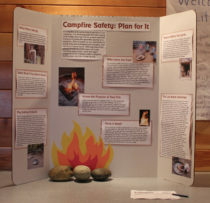 We led nature hikes and presented outdoor cooking demonstrations. Rain clouds floated overhead in the sky but they did not dampen the enthusiasm for a weekend in nature. As families arrived children poured out of the cars to join classmates already playing in the campground. The children quickly found the remains of a fort and began to make it their own. Several fallen redwoods surrounded the camping area. These tall giants were up to four feet in diameter and more than one-hundred in length. They provided a convenient ‘fence’ for the children. Some of these logs had shattered when they fell creating long shafts of redwood bark – convenient building materials. Several children – pretending to be mountain lions – were stalking human prey ready to pounce as their moms and dads walked by. 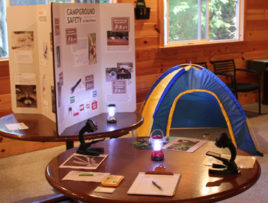 The sounds of kids playing and laughing filled the campground. 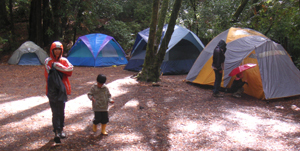 The adults unloaded their equipment and soon a small village of tents rose underneath the tall redwoods. A short time later smoke from the campfire was wafting through the giant trees as families began preparing for a ‘pot luck’ dinner. 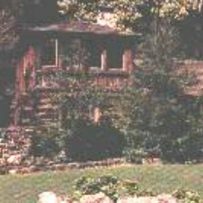 For families still arriving their senses were welcomed by the scent of damp forest duff, the aroma of food and the sounds of happy children and community. 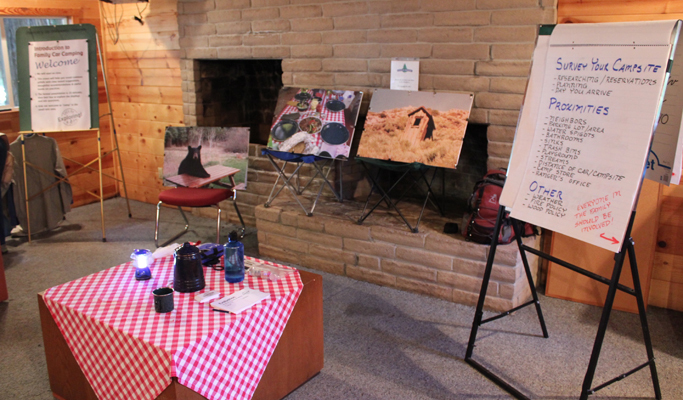 We helped to make dinner an educational event by cooking with a Dutch oven. 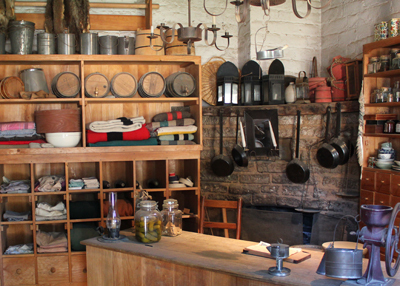 The Dutch oven is a cast-iron pot used by westward-moving settlers in the 1800s. One child was especially curious about this odd looking pot. When encouraged to measure ingredients and manage the coals (with supervision) he eagerly joined in. Everyone ate well that evening. Raindrops began to dot the tents as children brushed their teeth and bedded down. The gentle rain steadily increased throughout the night and eventually tested the weatherproofing of all the tents. In the morning everyone woke to a pristine world. The rain provided a much-needed bath for the forest after months of dry weather. As sunlight beamed into the damp woods rarely seen colors greeted the eye. In one instance the moss growing on the inside hollow of one redwood was an iridescent green. Within several minutes the bright colors were gone only to impress the viewer with another special sight several trees away. After breakfast, I lead a nature walk to Tip Toe Falls. 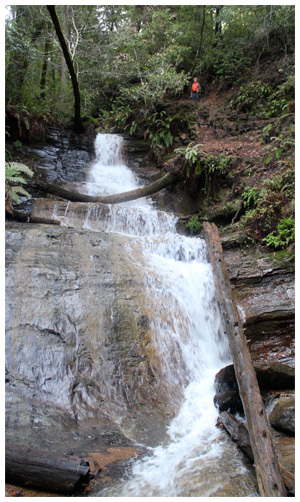 This short but visually-rich trail provided opportunities for exploring: redwoods, jumping rocks to cross a creek, visiting the falls, observing clusters of Lady Bugs, listening to chattering birds and rescuing an eight-inch Banana Slug from being stepped on. The park’s nature center provided a good place to conclude the hike. Everyone was surprised to have been away for over three hours. In the late afternoon, the children continued to fortify their fort and defend it against imaginary creatures. 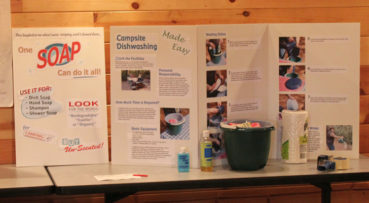 The second evening families worked on dinner, the Dutch oven demonstration drew increased interest from both adults and children. The chili was a cool evening winner. 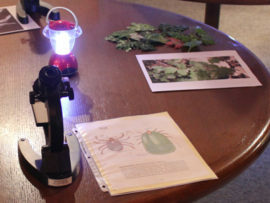 After dinner, I guided a nature walk. One child stopped on the trail and pointed to a spotted salamander. Everyone observed this primal looking creature then let it continue on its way. On the final morning, the parents enjoyed their coffee around a small fire – a few minutes of quiet before the kids woke. In several minutes the solitude was broken by children emerging from their tents. They made a beeline to their fort. The results of their engineering work were becoming apparent – in addition to a tee-pee shaped fort was a seven-foot-long piece of redwood bark had been transformed into a well-balanced teeter-totter. 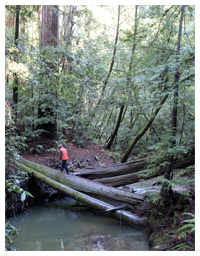 Log ramps allowed the kids to move quickly up the side of fallen redwoods. Some rope had been tied to the end several logs to create a simple pulley for moving wood and supplies. 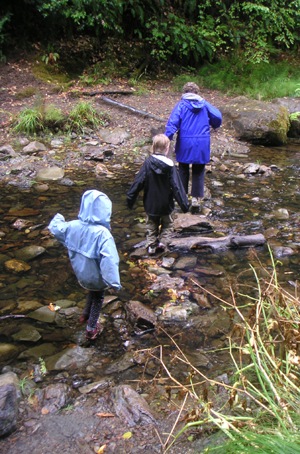 Evidence that young children also became more creative outdoors. It was a very revealing comment about the power of nature. The child turned on his heel and ran fast as a deer to the fort, eager to spend another few precious minutes in nature. Let’s spend a day walking among giants! 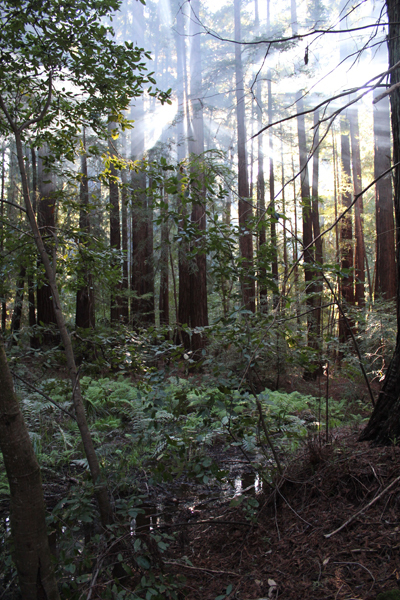 Big Basin Redwoods State Park is home to thousands of impressive redwoods that tower hundreds of feet overhead. 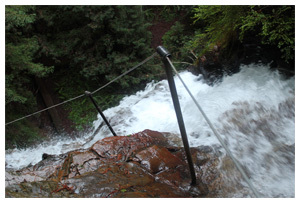 Our 11-mile loop hike will include the Golden Cascade, Silver, and the 65 foot Berry Creek Falls. Departure Time: 9am meet at the Sanborn Park Hostel, Saratoga, CA to determine carpools. 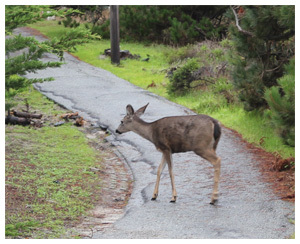 Re-Group Time: 10am by the Nature Center/Park Headquarters, Big Basin Redwoods State Park. Bring your own water, munchies and lunch. Wear layered clothes and sturdy shoes. A change of clothes and comfortable shoes are recommended to have in the in the car for your return. In the mid-1800s Elephant Seals were hunted for their oily blubber to light the lamps of San Francisco. But, within a few short decades, they were gone and thought to be extinct. Thanks to modern protections a small population has returned from the edge of extinction to reclaim their former territory on the California coast. In the wintertime at Año Nuevo hundreds of seals, from newborns, pregnant females and gigantic males congregate and we get to see them up close. The seals gain their name from the elephantine noses possessed by the males. The walking trips to see the seals are no more than 2 miles in length and about 1.5 to 2 hours in duration. Much of the terrain is loose sand. 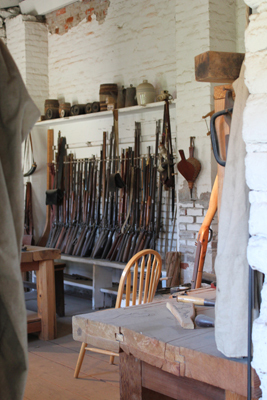 The hike begins with a thirty-minute walk from the Visitor’s Center to the tour staging area. Last chance latrine facilities are available. 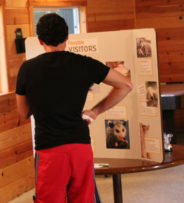 Here we will be joined by a docent who will guide us into the Wildlife Protection Area. Remember, bulls can move 20 feet, even in loose sand, in 2.5 seconds! You are requested to stay at least 40 feet away from the seals at all times. Meet at the Sanborn Park Hostel on Sunday, January 10, BY 9 a.m. to determine carpool arrangements. Reservations are required. 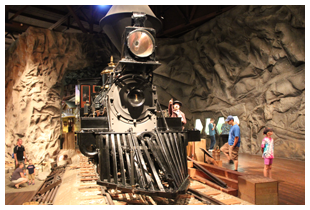 The fee is $10.00 per person, children under 3 are free. 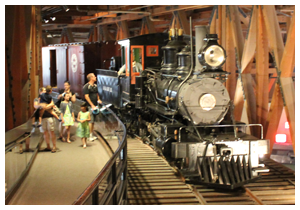 Parking is available at the reserve on a per vehicle ($5) basis and must be paid at the entrance station. Picnic tables are located near the Visitor’s Center for lunch. 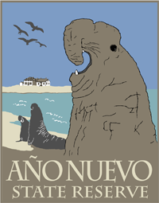 Año Nuevo is roughly an hour and fifteen-minute drive (55 miles) from the hostel. After visiting the reserve, weather permitting, we will continue north along Hwy 1 to explore the wildlife areas and tidepools between Pigeon Point Lighthouse and Montara. Plan to eat before entering the reserve as we will be hiking during lunch time. 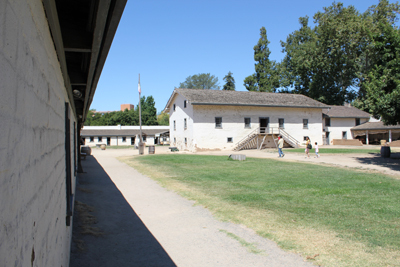 Picnic tables are available near the Visitors Center. The trip goes rain or shine. Recommended equipment/gear for this trip: rain jacket/clothes, headband/ear band, camera, comfortable sports or hiking shoes, a second pair of shoes to keep in the car for return, lunch, day pack with water. Wear layered clothes and come prepared for any kind of weather. Please note the reserve does not allow pets, smoking, food, gum chewing or umbrellas in the wildlife protection area. Join us on the last day of Spring as we depart on the Tiburon Ferry to explore the beautiful and historic Angel Island, State Park. Bring a day pack with foods for a picnic atop Mount Livermore which offers breathtaking 360-degree views of the Bay. Be prepared for 5+ miles of hiking on this all-day trip. Meet at the Ferry Terminal in Tiburon to depart on the 10:00 am ferry. Expect two-hour drive from the south bay. Directions: Past the Golden Gate Bridge, drive 101 north, take the Tiburon exit (Hwy-131) and drive 10 minutes. Look for the $5.00 a day parking area located next to Library and Home Savings Bank on left. Walk several blocks to the STOP sign, the ferry is on left. The summer at Sanborn provides opportunities to meet others from distant lands and explore the abundant areas around the hostel. On Saturday morning we depart for Ano Nuevo State Reserve to hike among the dunes and view the massive bull Elephant Seals. Some bulls can be up to 16 feet in length! The afternoon will be spent beachcombing and exploring the coastline. In the evening we return to Sanborn Park Hostel for grilling your favorite food on the bbq, meeting new folks, sitting around the fire, watching deer in a nearby field, and telling stories. Creative thoughts and those young at heart are welcome. We overnight at the hostel. 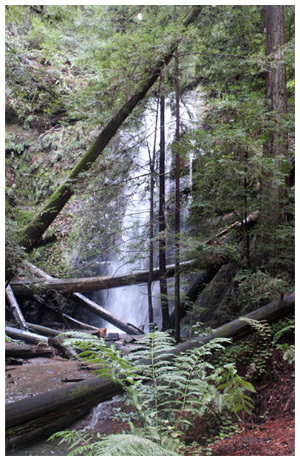 On Sunday, we head to Big Basin Redwoods State Park to hike the 10 mile Berry Creek Falls Loop. 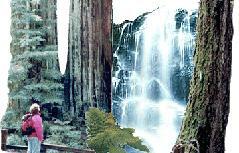 This loop includes the remarkable Golden Falls, Silver Falls and the 65 foot Berry Creek Falls. 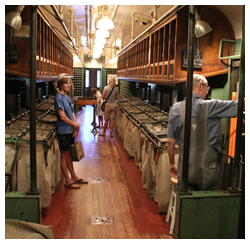 All trips depart from the hostel at 9:00 am. Overnight reservations recommend fee per person is $8.50. 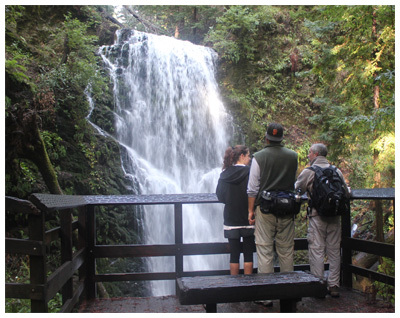 Join us for one of the most picturesque hikes in Big Basin. 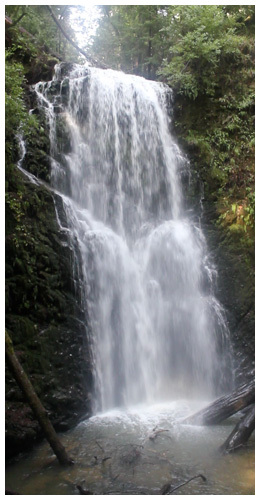 The 10.5-mile loop hike includes the remarkable Golden Falls, Silver Falls, and the 65-foot Berry Creek Falls. The creeks should be gorged with spring run-off so the falls should be very impressive. This mostly old-growth redwood park will be very lush and provide great sightseeing and nature viewing. This is a moderate hike as plenty of ups and downs will be encountered. The hike will take roughly six hours to complete. 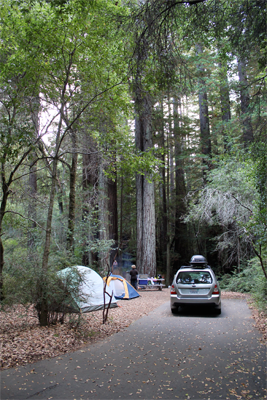 Meet in front of the Big Basin Park Headquarters, just off of 236 “Big Basin Highway” at 9:00 am. Please allow for one hour travel time from San Jose area. Parking fee of $5 dollars in required.